Brudzinski pro bono representation of mariners at Coast Guard suspension and revocation hearings. 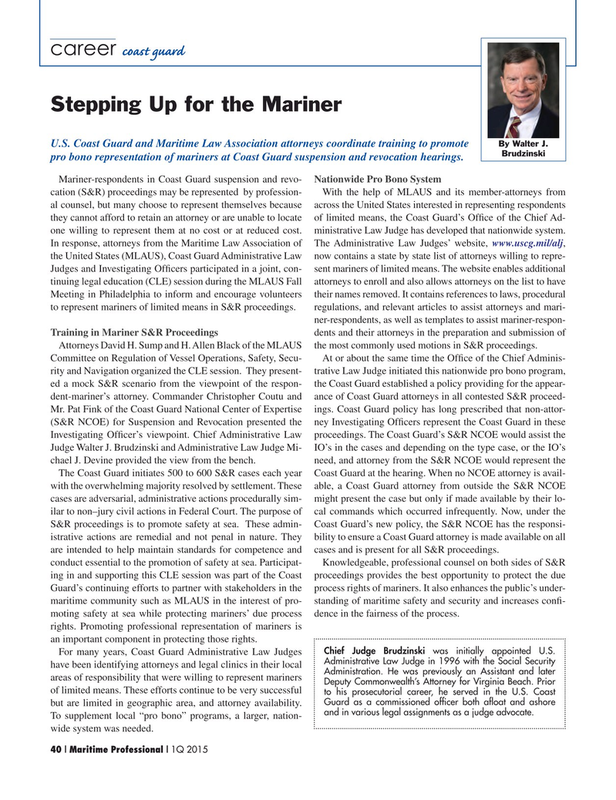 Mariner-respondents in Coast Guard suspension and revo- Nationwide Pro Bono System cation (S&R) proceedings may be represented by profession- With the help of MLAUS and its member-attorneys from al counsel, but many choose to represent themselves because across the United States interested in representing respondents they cannot afford to retain an attorney or are unable to locate of limited means, the Coast Guard’s Of? ce of the Chief Ad- one willing to represent them at no cost or at reduced cost. ministrative Law Judge has developed that nationwide system. Attorneys David H. Sump and H. Allen Black of the MLAUS the most commonly used motions in S&R proceedings. Guard’s continuing efforts to partner with stakeholders in the process rights of mariners. It also enhances the public’s under- maritime community such as MLAUS in the interest of pro- standing of maritime safety and security and increases con? - moting safety at sea while protecting mariners’ due process dence in the fairness of the process. rights. Promoting professional representation of mariners is an important component in protecting those rights. Chief Judge Brudzinski was initially appointed U.S.